We can all relate. We’ve all experienced endings, transitions and new beginnings. Some endings have segued into good periods and some bad. And then, of course, there’s that ultimate ending and new beginning that Pastor Miles was talking about today. On a less daunting but yet important front, several members of The Kansas City Star editorial staff are in the process of ending careers and beginning retirements that some of them didn’t anticipate coming so soon. Five longtime staff members recently accepted another newsroom buyout. They are editorial page editor Steve Paul, editorial page writer and op-ed columnist Barbara Shelly, theater critic Robert Trussell, online editor Jody Cox and assistant sports editor Mark Zeligman. Their departures, I understand, followed the layoffs of about two dozen employees in other parts of the company. But even those layoffs and buyouts weren’t enough for The Star’s owner, the McClatchy Co., to put down its bloody scythe. No sooner had the newsroom buyouts come to light than five longtime news, features and photo employees were called in and told their services were no longer needed. They are medical writer Alan Bavley, assistant business editor Greg Hack, assistant photo editor Mary Schulte, features writer Jim Fussell and Metro reporter Brian Burnes. 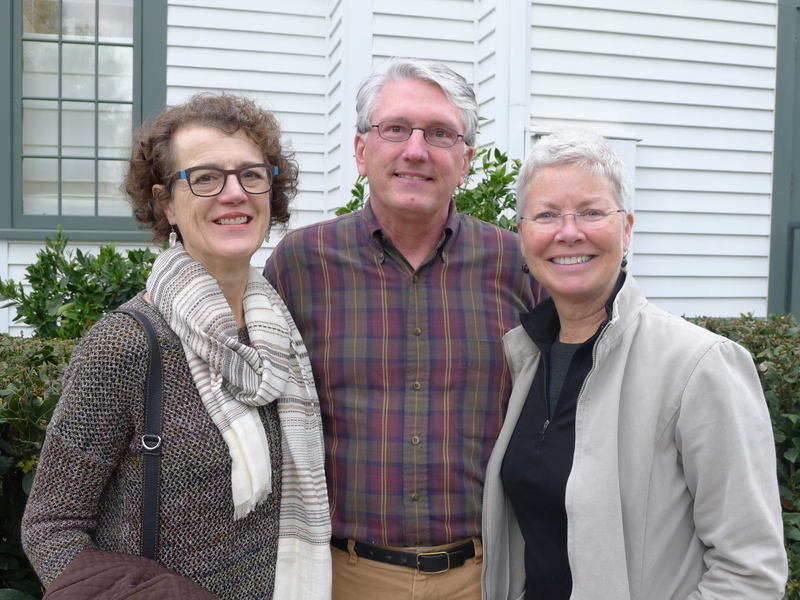 Today, I want to put the spotlight on two of those people — the two I knew the best — Shelly and Burnes. In the mid-1980s, Shelly was a young reporter covering City Hall for the afternoon Star, while I was covering the hall for the morning Kansas City Times. (The Times was dropped in 1990, with The Star moving to mornings.) Shelly and I shared office space in the 29th-floor “press room,” which offered a beautiful view of the Northland. In those days, the papers competed (it was largely artificial but pushed both papers to excel), and Shelly was a tough competitor, beating me to the punch on stories more often than I liked to admit. But she was unfailingly gracious and friendly, and we always got along well. She went on to nab a coveted spot on the editorial board, where she wrote aggressively and perspicaciously on a wide range of subjects, including the Kansas City school board, the school district and the Missouri and Kansas legislatures. 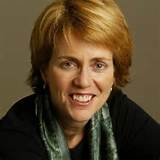 Her last column, which ran Friday, was a call for Missouri and Kansas residents to elect legislators whose foremost allegiance was to their regions and constituents, not to ideological movements, such as the Republican-led push in the Missouri Capitol to change the state Constitution to allow businesses to discriminate against gays and lesbians. In the current political climate, any progress in this region will come as a result of smart, visionary leadership at the local level. And from a strong, united defense against the threats from Jefferson City and Topeka. With that, she signed off, for good, as an employee of The Kansas City Star. Brian Burnes has been one of The Star’s two best storytellers, along with Don Bradley, who, I presume, is staying on. I worked with Burnes in 2005-2006 at my last KC Star outpost, the Independence bureau. The bureau was in a storefront — next to a mattress store — on the northeast quadrant of I-70 and Noland Road. We had about eight reporters in the bureau, and Burnes was among them. What I remember most about him was his professionalism — always showing up with his “work face” on, never complaining and always accommodating with editors — not an easy way to be, given the tensions of the newsroom and the egos often at play. 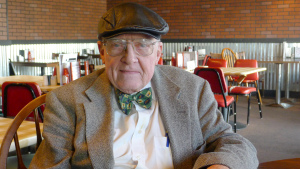 His primary “beat” was Independence government, but he was also The Star’s all-purpose history writer. One of his biggest contributions to the paper has been his exhaustive coverage of the Hawley family’s excavation of the Steamboat Arabia and its conversion to a popular museum in the River Market. Early this month, Burnes wrote a Page 1 story about the Hawley family’s next possible undertaking — excavating the remains of the steamship Malta, which sank about 80 miles east of Kansas City in 1841. Unless Burnes has another story rattling around in “holdover,” he went out on a high note Saturday with a great story about a woman named Stacey Stevens, whose 19-year-old son Matthew was struck and killed by a hit-and-run driver last September in Neosho. The story focused on Stacey Stevens’ relentless push for a legislative bill that would increase the penalty for drivers in fatal hit-and-run cases from up to four years in prison to up to 10 years. Accompanying the front-page story was a moving photo of Stevens standing beside, and holding, a memorial cross bearing Matthew’s name. When it comes to paying for their actions after killing someone, hit-and-run drivers — responsible for a fifth of pedestrian fatalities nationwide — get away with too much, she believes. By leaving the scene, they deprive investigators of crucial evidence, including a timely interview and the chance to determine impairment. All 10 of the departing employees are leaving The Star a poorer place. Most — maybe none — will be replaced…I wish each of them a good new beginning, whatever they do and wherever they go. And I hope they all continue contributing, in some manner, to progress in Kansas City. The NCAA basketball tournament is entertaining; the presidential primaries are ever compelling; and the arrival of spring is welcome. But, man, I wish I was in Cuba this week! — President Obama arrives at Havana’s Jose Marti International Airport at 3:50 p.m. today for a three-day visit. 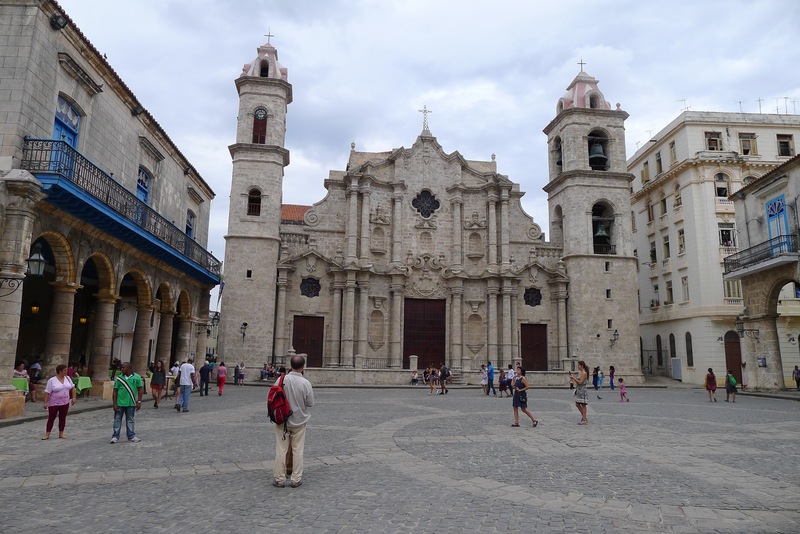 Within a couple of hours of his arrival, he will do a walking tour of Old Havana and take in the sights, including Catedral de San Cristobal. — Last week, the president eased travel restrictions to Cuba, which will allow Americans to visit Cuba (and take commercial flights there) without signing up for expensive, U.S. government-sanctioned, “educational” tours, like one that Patty and I were on in late January and early February. — Starwood Hotels and Resorts, which operates Sheraton hotels, among others, signed a deal to refurbish and manage at least two hotels in the Havana area, including a 186-room hotel in the upscale suburb, relatively speaking, of Miramir. Most hotels in Cuba are government owned (you can tell by the service and shortcomings), and Starwood will be the first American hospitality chain to run hotels there. — The Rolling Stones will perform in a free concert Friday at the Ciudad Deportiva de la Habana arena in southwestern Havana. The New York Times has given wide coverage to the developments and the Obama trip. 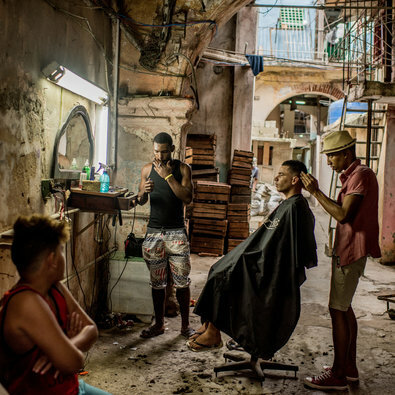 The centerpiece in today’s paper, for example, is a story under the headline “Obama Hopes Cuba Visit Can Be Harbinger of Political Change.” Above the headline is a tantalizing, five-column photo of a “barber shop,” consisting of a single chair on a crumbling floor, with a customer, a barber and several men standing and sitting around. It’s hard to imagine the plight of most Cubans and their impoverished circumstances unless you’ve been there. Among other things, the basic essentials of life — decent food, clothing and shelter and reliable transportation — are very difficult for many Cubans to come by. Several times on trips to outlying parts of the island, we saw people dispersed around intersections — just hanging around, to all appearances — waiting for military personnel to randomly stop private vehicles and arrange transportation for those waiting for rides. As I outlined in two earlier posts, the Cuban economy is upside down, with professional people like doctors and engineers — all paid by the government, of course — making about $30 a month, while people in the hospitality industry (those working on tips) and taxi drivers making that much and often much more each day. It is truly f_____ up. And the damage, repression and discouragement that communism and the Castros have inflicted on the Cuban people makes the blood boil when you see it up close. And as much as we might hope that Cuban-American relations will improve and that Cuba will begin to emerge from its quaint but pathetic time warp, almost everything depends on whether any light bulbs go off in the heads of Fidel, who would be 90 in August, and Raul, who is 84. Raul has said he will step down when his current five-year term as president expires in 2018. If he does so, it’s anyone’s guess what will ensue and who will rule. The country’s first vice president, 55-year-old Miguel Diaz-Canel Bermudez, is considered the leading candidate, but another Castro — Alejandro Castro Espin, Raul’s 50-year-old son — also looms as a possibility. Espin is a blowhard who has said Cubans “have known positive and successful experiences under socialism,” and Diaz-Canel’s views have been described as similarly hardline. All in all, the prospects for long-term improvement in the lives of Cubans looks quite dim. All we can do is hope for enlightenment and change and, in the meantime, admire President Obama’s attempts to chip away at longstanding barriers between the two countries. Arrival at Jose Marti International Airport in Havana, 3:50 p.m.
Meet-and-greet at U.S. Embassy, 4:50 p.m.
Sight-seeing in Old Havana, including the Catedral de San Cristobal de la Habana, 5:40 p.m. Baseball have between the Tampa Bay Rays at Cuban National Team at Estadio Latinoamericano, 1 p.m.
New KC Star publisher Tony Berg had his public “coming out” yesterday with an impressive appearance on KCUR’s Central Standard show. Berg exuded the energy one would expect from a 38-year-old person who two months ago landed the most important job on the Kansas City media scene. Among other things, he acknowledged that The Star was facing challenges and was in a critical period of “transformation,” with the company’s emphasis shifting from print to digital. If you’ve been reading this blog in recent weeks, you know Berg vowed from the get-goo to address the delivery situation, which crumbled under the previous publisher, Mi-Ai Parrish. He and leaders of the “audience development” department have responded personally to people who have complained about delivery problems. With that attitude, I feel, they should be able to get things smoothed out and perhaps even regain a significant number of subscribers who dropped the paper out of frustration and disgust. Unfortunately, there’s still the matter of skyrocketing subscription rates — upwards of $40 a month for a standard subscription, from what I’ve heard. Out there, as in drumming in to people through an advertising campaign that The Star is still the primary and most authoritative news source for a majority of area residents, whether in print form or online. Kaufmann spent several minutes pressing Berg on how The Star could grow — and be successful in its transformation — as long as it continued laying off employees and offering buyouts. “Is there an end point?” Kaufmann asked, referring to the downsizing, which began in 2008 and has not let up. 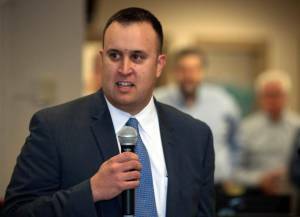 Berg deflected the line of questioning, repeatedly asserting that the situation should not be looked at as reduction but rather a redistribution and realignment of resources. Just this week, The Star offered another round of editorial-side layoffs, with the goal of cutting five to 10 staff members. The deadline for applying for the buyout was yesterday, and Kauffman said on the air that theater critic Robert Trussell had decided to take the offer. Trussell has been in the Features Department more than 30 years. In recent years, features has also lost its full-time movie critic (Robert Butler), its fine arts critic (Alice Thorson) and its full-time music critic (Paul Horsley). None has been replaced; The Star has chosen to outsource those tasks to freelancers, and you can bet that’s what it will do now with theater criticism. It’s too bad that when Kaufmann was interviewing Berg, she didn’t know what former KC Star investigative reporter Karen Dillon posted on Facebook Thursday night. 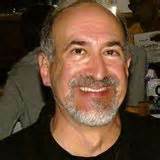 Dillon, now a reporter for the Lawrence Journal-World, said other editorial-side employees who will take buyouts included Jody Cox, online editor, who has been with the paper about 20 years, and assistant sports editor Mark Zeligman, who has put in at least 20 years. But Dillon’s bombshell was that two of The Star’s four editorial-page writers, including editorial-page editor Steve Paul, are leaving. Paul has been with the paper more than 40 years. He was named editorial page editor 18 months ago. Barb Shelly, the other departing editorial writer, has been with the paper more than 35 years. 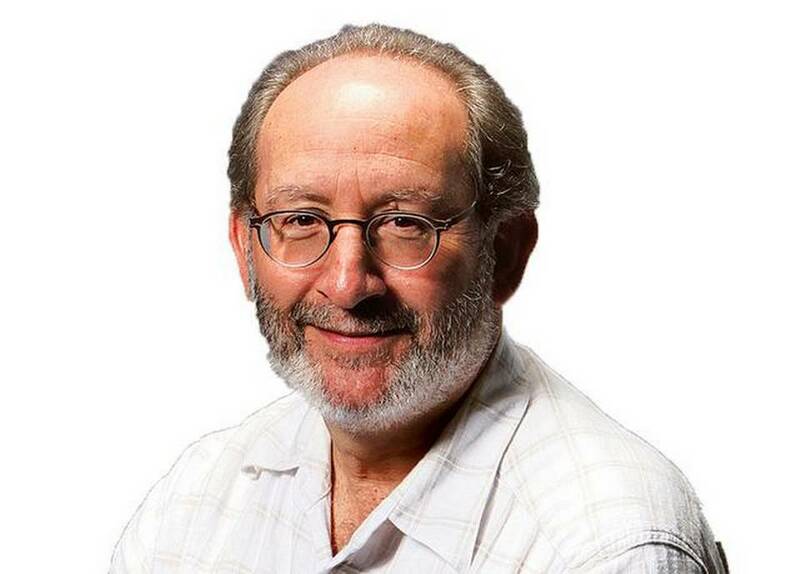 If Shelly and Paul are not replaced, it would leave The Star with only Lewis Diuguid and Yael Abouhalkah manning the editorial page, which sets the paper’s political tone and civic compass. I’ve got to assume Berg and Star editor Mike Fannin will fill at least one of the editorial-page posts being vacated. Otherwise, how could The Star continue putting out a decent editorial page? Already, the number of staff-generated editorials has dropped significantly, and the Monday Op-Ed page has been dropped. When Tony Berg said The Star has challenges, yes, it sure does. It’s going to take all of Berg’s youthful energy and every bit of whatever resourcefulness he has to keep The Star moving forward. Wanted: Five to 10 good men and women to leave The Kansas City Star newsroom right away. That’s the “classified ad” The Star recently posted as it continues to probe how to publish a respectable news product with as few reporters, editors and photographers as possible. With they buyout comes a few months’ severance pay and maybe the coveted sheet-cake party. (The sheet-cake party really should be written into the buyout deal because it helps lessen the indignity of the often-premature departure.) I’m told today is the deadline to apply for the buyout, and if I hear what happens, I’ll let you know. The buyouts come on the heels of — according to a source — 26 layoffs in other divisions in recent weeks. …By my last count, The Star was down to about 20 Metro reporters, and I hate to think what would happen if that number went down to, say, 15. But slow asphyxiation does not appear to be a major concern of The Star’s owner, the McClatchy Co. of Sacramento. It has been trying to slash its way to greater profitability eight of the 10 years it has owned The Star. Of course, that’s exactly what a one billion dollar debt will make a company do — gasp for air every day it operates. The local template for this type of downward spiral was established many years ago with a company many of you will remember — Payless Cashways. Payless had been publicly owned and decided to take itself private. 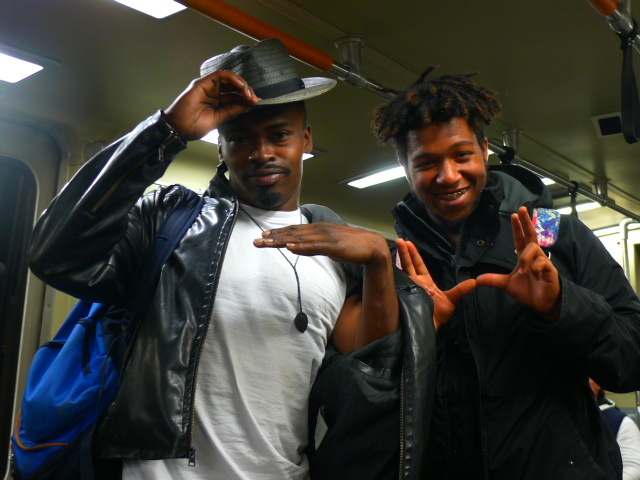 A group led by c.e.o. David Stanley (dubbed “Minnesota Dave” because he tried to run Payless while maintaining his permanent residence in Minnesota) bought the operation but made the fatal mistake of paying way too much. After a few years of treading water, the company went under. Dave flew back to Minnesota from KC for the last time, and Sutherlands took over some of the stores. As I’ve said many times, McClatchy was a relatively small fish in the newspaper industry back in 2006, when upper management made the unwise decision to swallow the much larger Knight Ridder Co., which owned 32 papers, including The Star. Unlike McClatchy’s then-c.e.o. Gary Pruitt, Knight Ridder’s Tony Ridder saw the cliff that the newspaper industry was heading toward, and he pulled up at just the right time, making himself and several other top managers millions of dollars. Former Star publisher Art Brisbane, who had joined the corporate office, was one of the beneficiaries. I have no idea what’s ahead for McClatchy and The Star. I would love to see McClatchy sell The Star to someone who values newspapers and has deep pockets — someone like Warren Buffet, who has bought one chain, Media General, as well as the Omaha World-Herald and The Buffalo News — but I doubt that’s going to happen. The Star, I believe, has been and will continue to be the biggest moneymaker in the McClatchy chain, and McClatchy probably will continue to bleed it for cash as long as it can. Another place The Star is making good money is on its contract print operation. At its still relatively new and modern press building, which also opened in 2006, The Star is printing several other publications, including the Topeka Capital-Journal, the Lawrence Journal-World, the Pitch and the regional editions of the Wall Street Journal and USA Today. Just this week, The Star and The Wichita Eagle announced that The Eagle would be transferring its printing and packaging operations to The Star’s printing plant. As a result, The Eagle is eliminating 74 full- and part-time positions, and it is planning to sell its downtown buildings. Now, that’s fine and dandy for The Star but not good at all for The Eagle’s print subscribers. The Eagle’s evening deadline probably will move up to about 7 p.m., to allow time for the papers to be printed and hauled the 200 miles back to Wichita. Print subscribers will get little, if any, breaking night-time news in their morning papers. The reasoning behind this move is to advance McClatchy’s strategy of weaning print readers to the electronic subscriptions. The problem is online advertising isn’t nearly as profitable as print. But being latecomers to the electronic waterfall, McClatchy and other chains really have no choice at this point. Well, I’ll be curious to see what The Eagle does after selling its three-story building downtown. Wouldn’t surprise me if it rented space somewhere. McClatchy’s got to stay light-footed for whatever dance numbers it next choreographs. 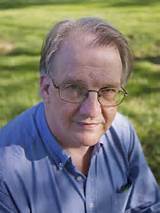 Many of you have probably heard this, but a longtime Star editor, Kirk Weber, died Sunday. 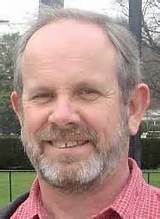 Kirk was an assignment and story editor, first on the former state desk and later the Metro desk. 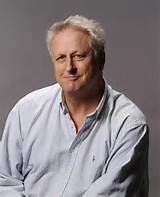 As a rule, compulsive personalities are plentiful in newsrooms — I was most assuredly in that category — but Kirk, with his affable, relaxed manner, was an exception. He got along with everyone, and I think it’s safe to say that just about every reporter who ever worked for and with him admired and liked him. Health problems plagued him on and off since he was in his 40s, but he pushed on without complaint. Among others, he leaves two daughters and a son. He was 65. Rest in peace, Kirk. 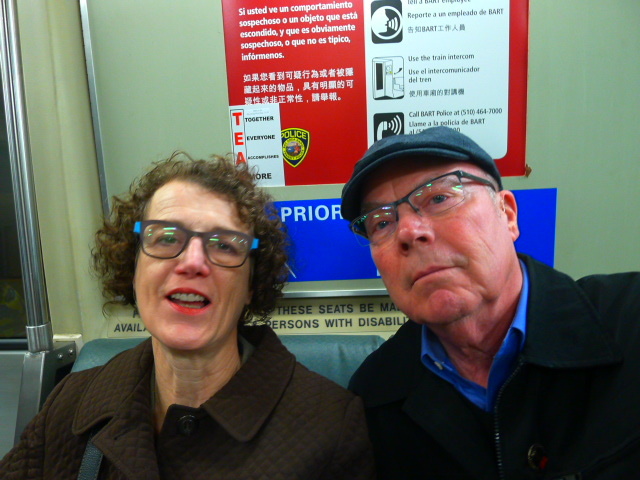 Patty and I returned home last night from the Bay Area, where we spent six days, partly on WomenSpirit business and partly to visit relatives and friends. We spent most of our time in Berkeley, San Francisco and Napa, where one of my cousins lives. 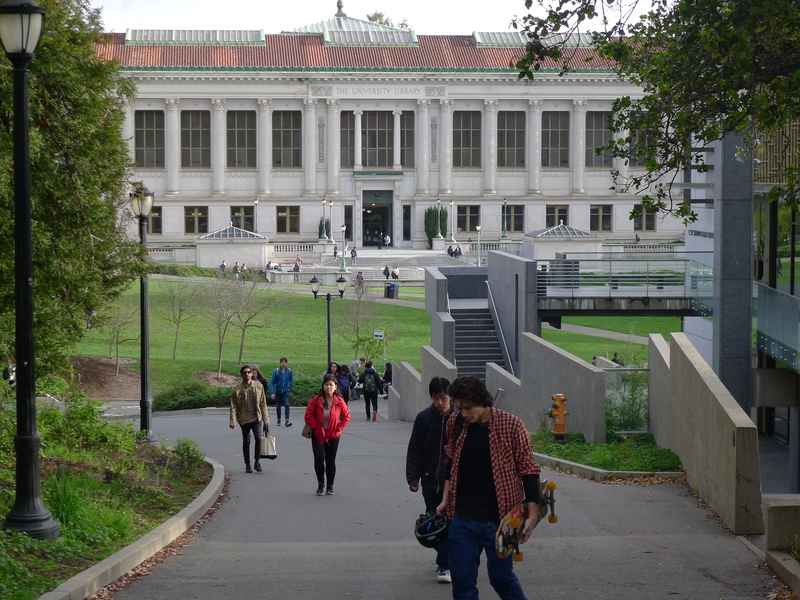 Patty was displaying her robes, blouses and other clergy vestments at two Berkeley seminaries on a very steep hill just west of the University of California campus. Home to several seminaries, it is known as “Holy Hill.” We spent four nights at Church Divinity School of the Pacific, an Episcopal seminary, and two in the East Bay community of El Cerrito, where two good friends live. Patty goes to Holy Hill almost every year, and this is the second time I’ve gone in the last few years. If I had to live in California (I’ll never leave Kansas City, of course), I would live in the East Bay, which includes, Berkeley, Oakland, Richmond and other municipalities. Much of the East Bay is more affordable than San Francisco, but San Francisco is a relatively short train ride away. But enough of the commentary…On with the photos! 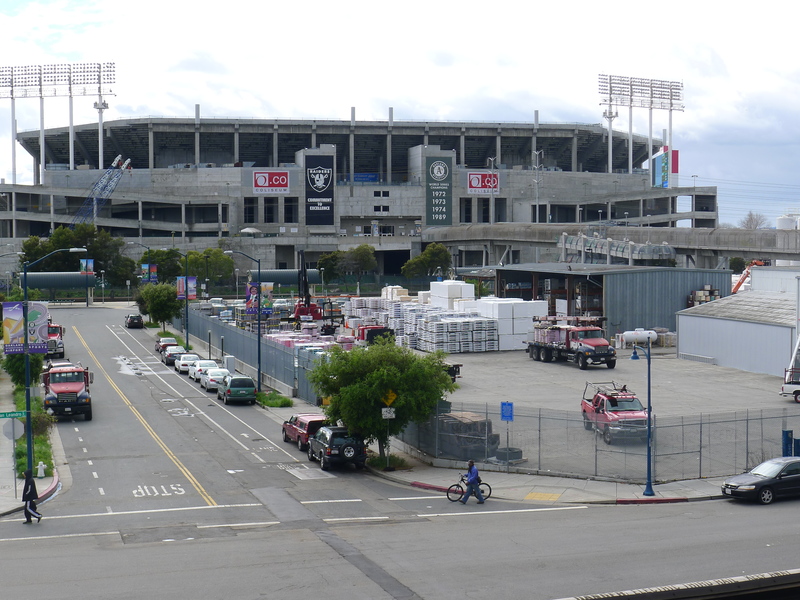 If you fly into the Oakland airport, one of your first views after getting off the tram that takes you to the BART (Bay Area Rapid Transit) station is the Oakland Coliseum, home of the loathsome Raiders…An adjacent roofing supply company is the perfect accompaniment to this eyesore of a stadium. 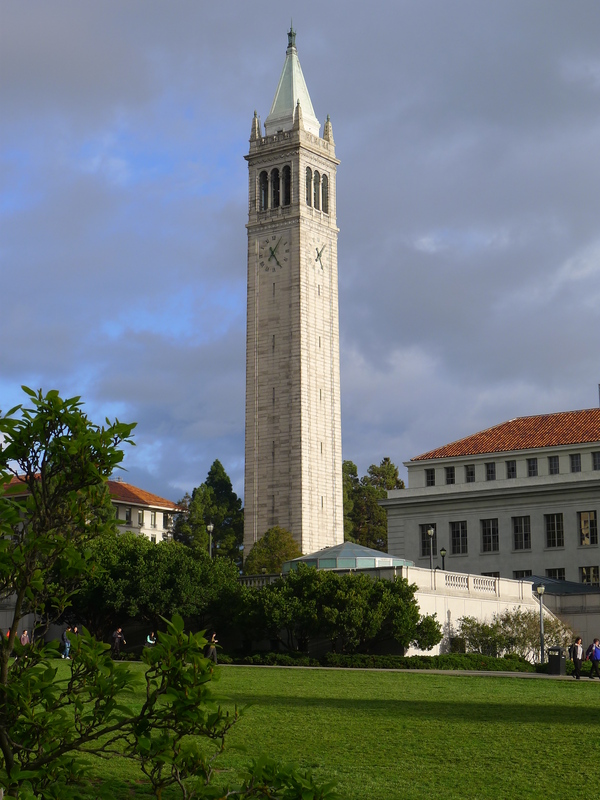 The sightseeing gets a lot better in Berkeley, home of the University of California. This is looking toward the library. 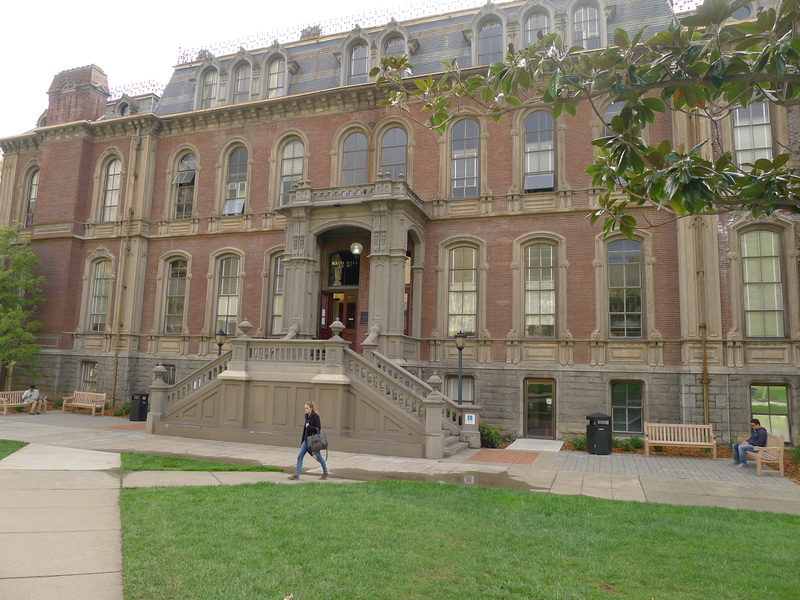 South Hall, the oldest building on campus — built in 1873. 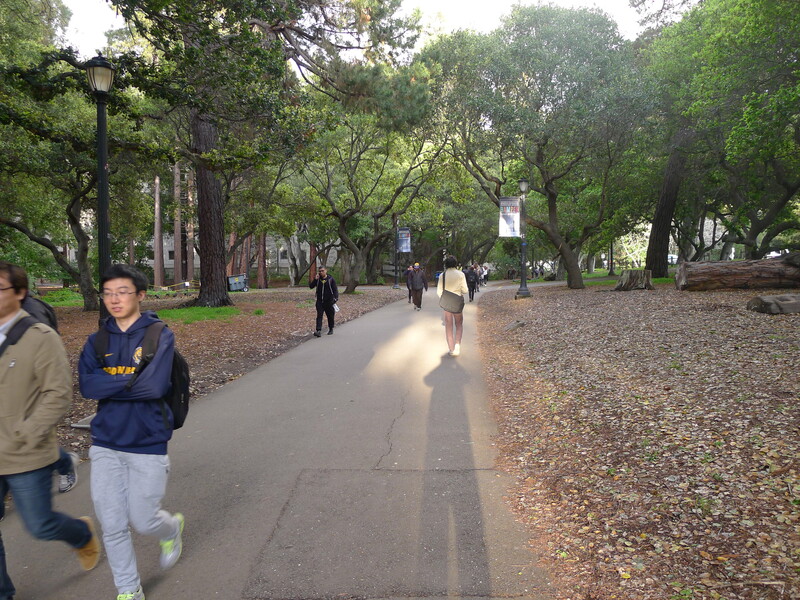 A campus pathway that winds down the hill toward downtown Berkeley. 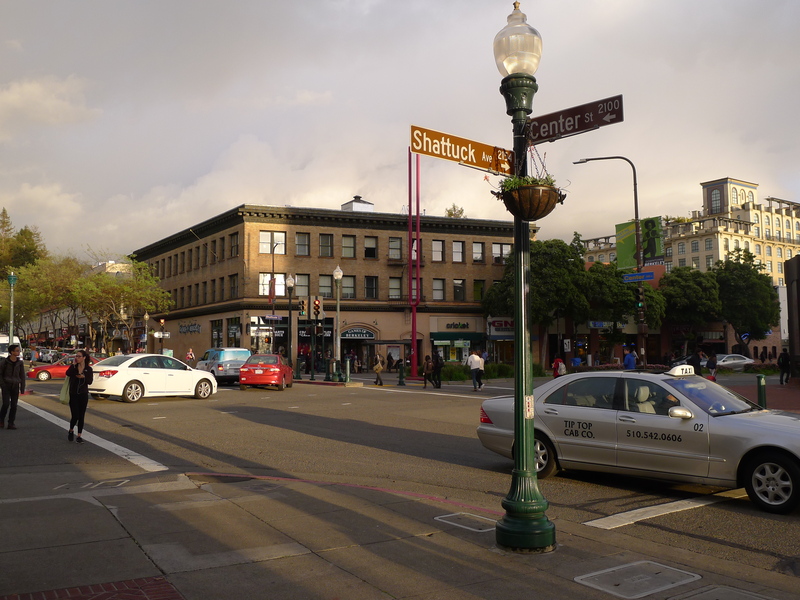 The heart of Berkeley, Shattuck and Cente. 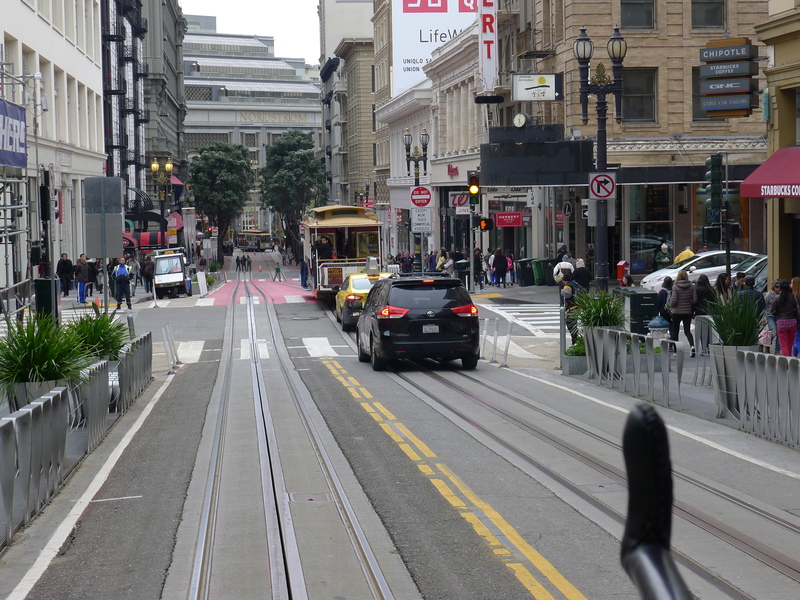 We jump to San Francisco and its broad Market Street, which cuts southwest from The Embarcadero through downtown and out to the hills. After a 26-year-old civil engineer named Jasper O’Farrell proposed the street widening in the 1840s, opponents suggested a lynching, literally, and O’Farrell fled to Sonoma, where he remained until passions cooled. Ah, those cable cars. 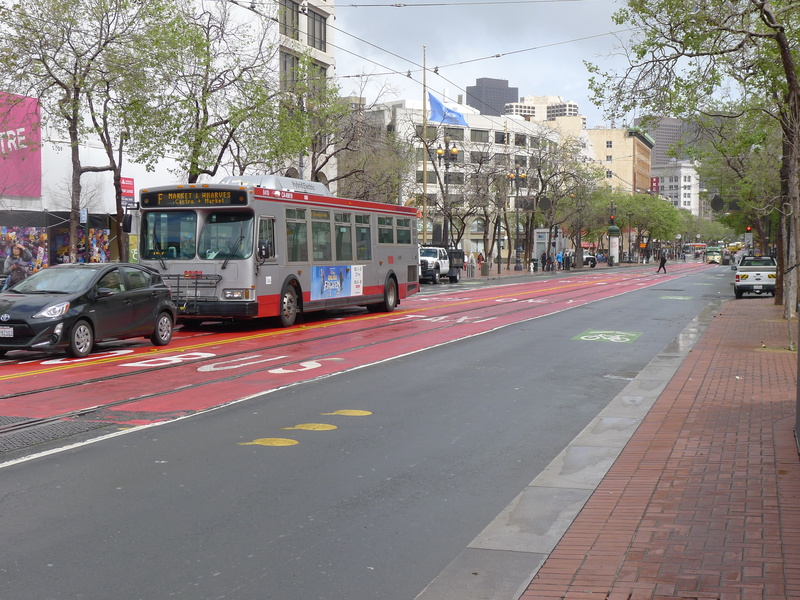 Here’s a major turnaround at Powell and Market. Heading up the hill from Market. 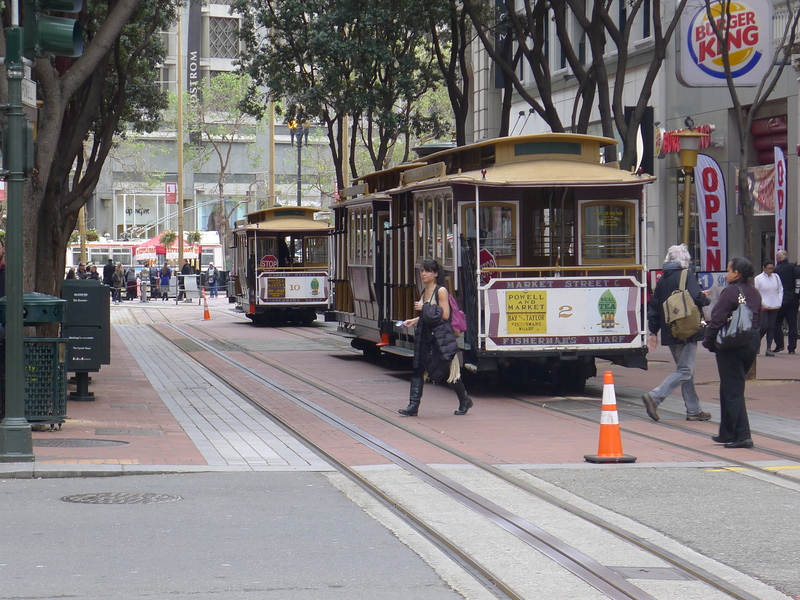 The idea for the cable cars originated with a man named Andrew Hallidie after he saw a horse-drawn streetcar slide backwards down a wet hill in 1869, killing five horses. 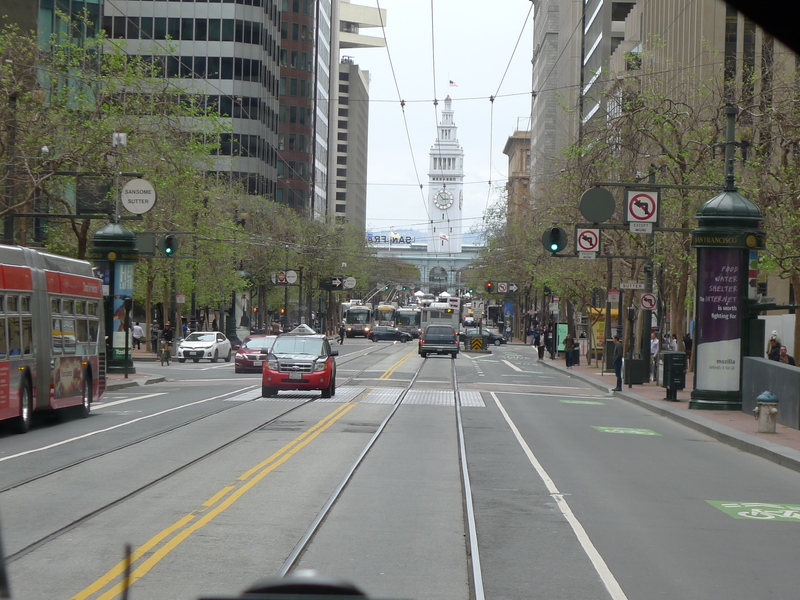 Hallidie had experience with wire-rope technology and used it to beat the fearsome hills of San Francisco. 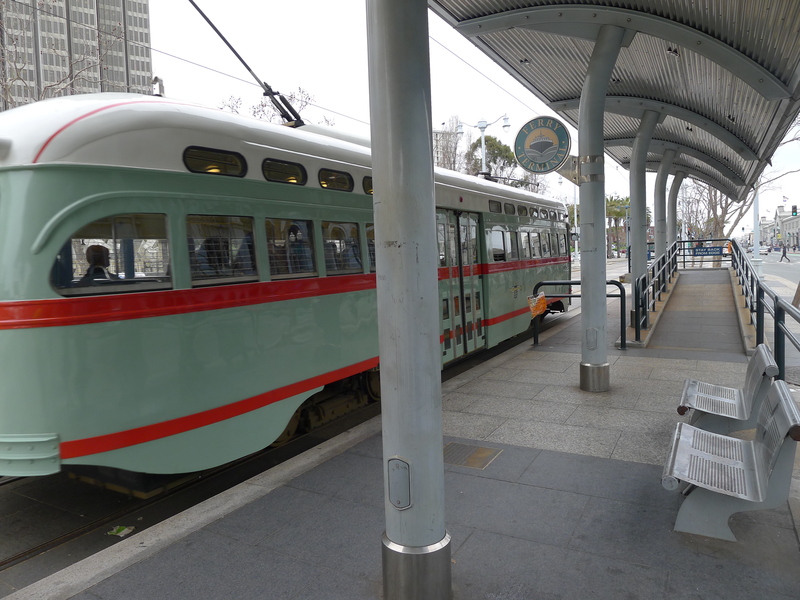 I took the cable car to Fisherman’s Wharf. That’s the Bay Bridge in the distance. 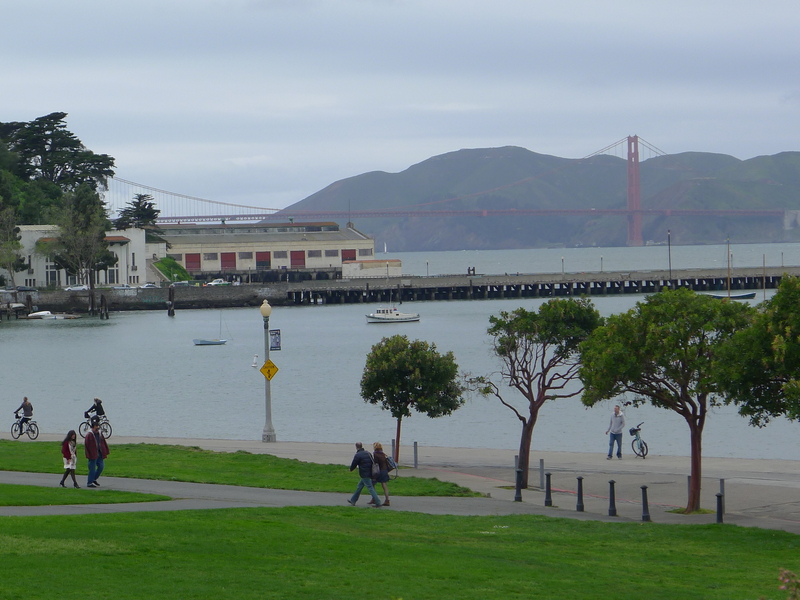 The wharf offers a great view of the Golden Gate Bridge, which leads to Sausalito and the North Bay. 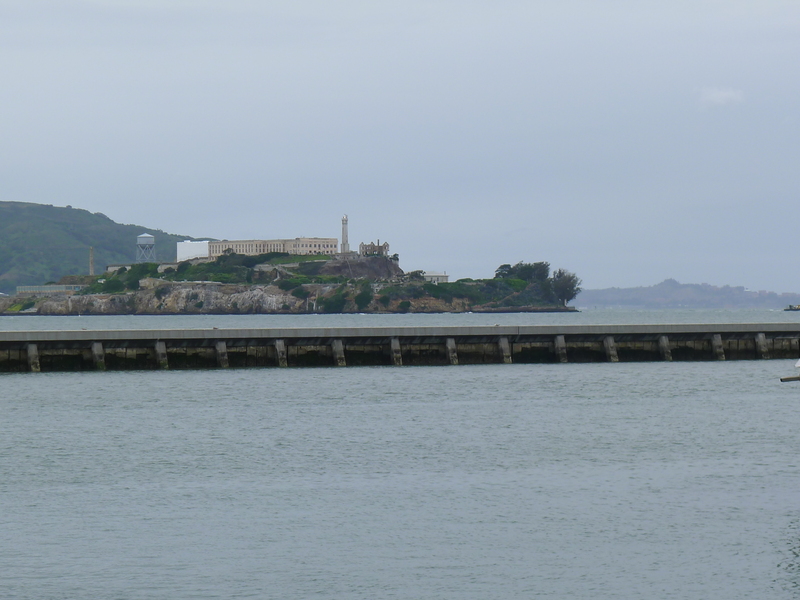 Alcatraz…The only inmates to escape were Clarence Anglin, John Anglin and Frank Morris, who at least made it down to the water in June 1962. Chances are their homemade — make that prison-made — raft didn’t make it to across the Bay. But no one knows for sure. Their bodies were never found. 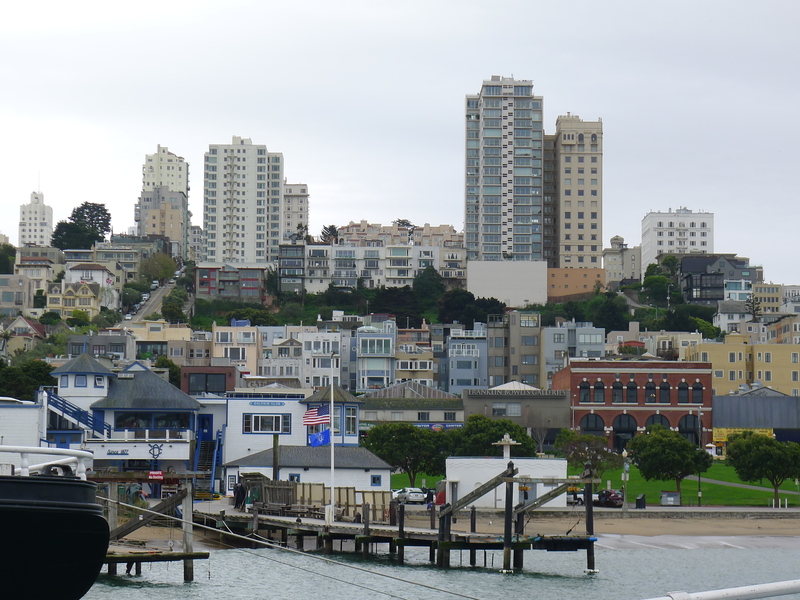 Looking toward the hills of San Francisco from Hyde Pier at Fisherman’s Wharf. 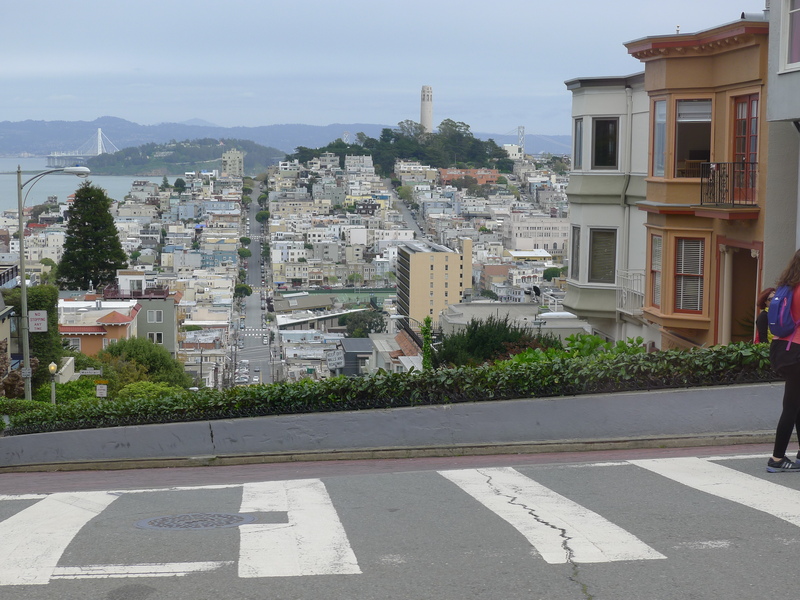 The top of famous Lombard Street, a twisting, brick street that would be largely inaccessible were it not for cable cars and motorized vehicles. 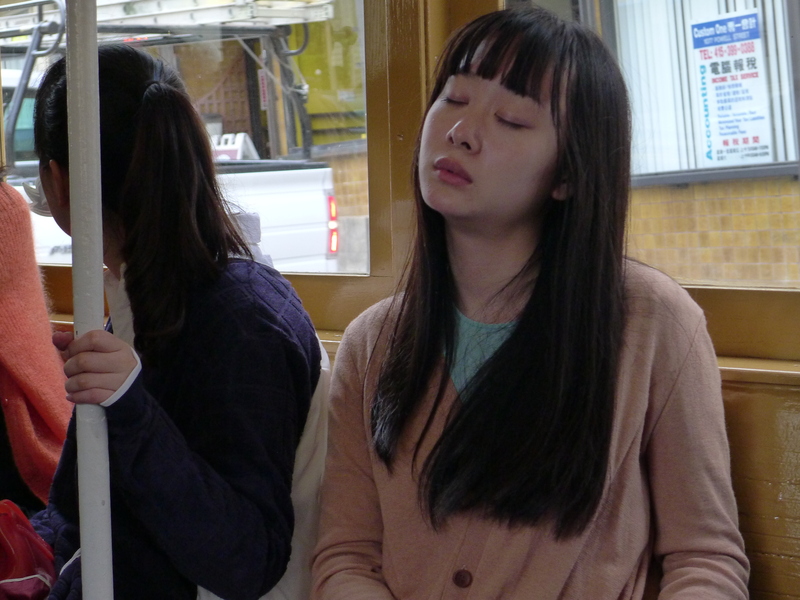 Not everyone was riveted to the sights from the cable car. 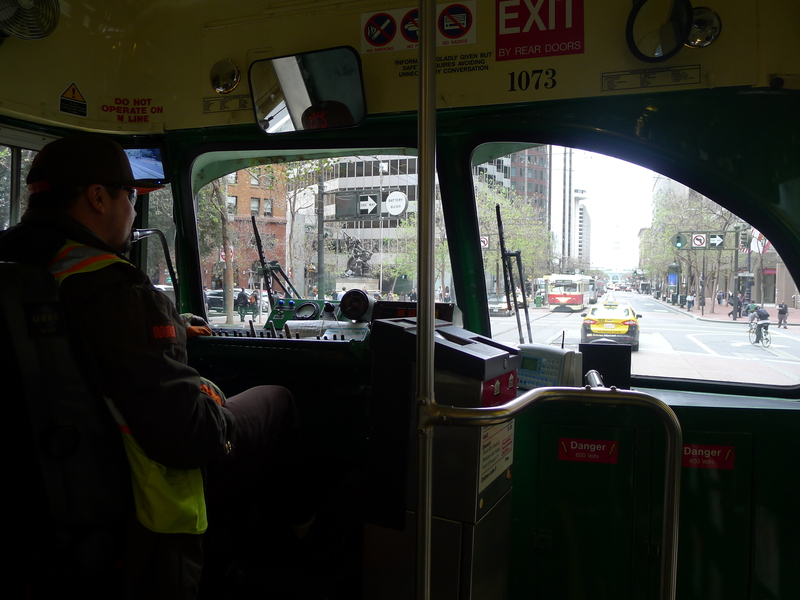 This is from a streetcar, heading toward the Ferry Building at The Embarcadero. A windshield view of Market Street. 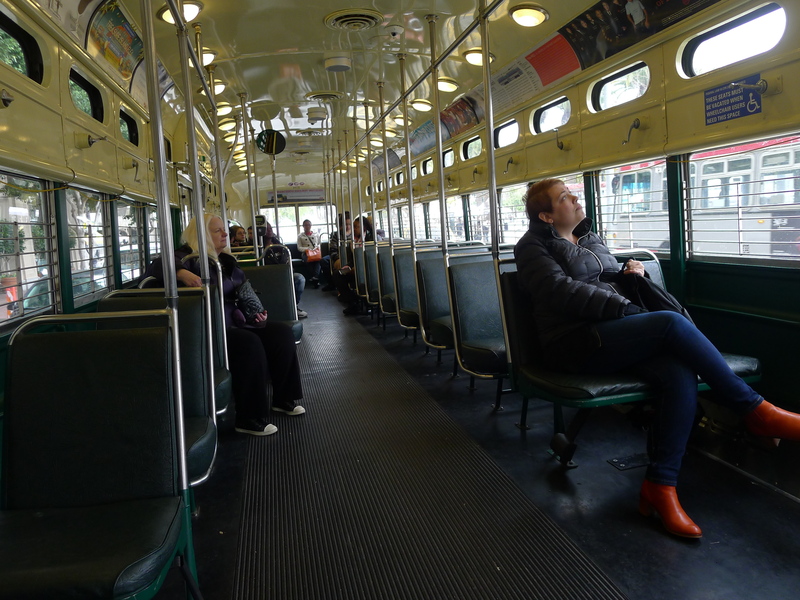 The San Francisco streetcars have an old-time feel and look, but they sparkle inside and and out. This one was about to leave the Terminal Building. The Golden Gate Ferry, at The Embarcadero, moves a lot of people across the bay. 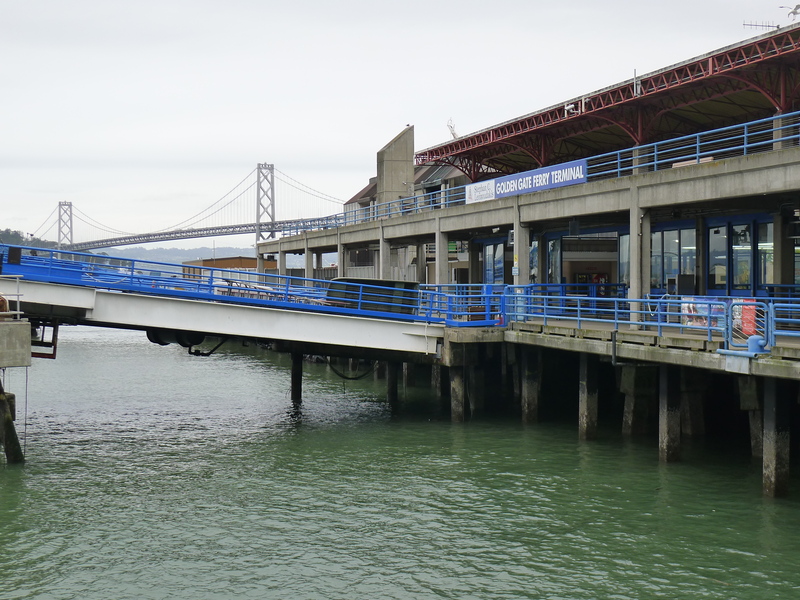 The Bay Bridge, from the ferry terminal. 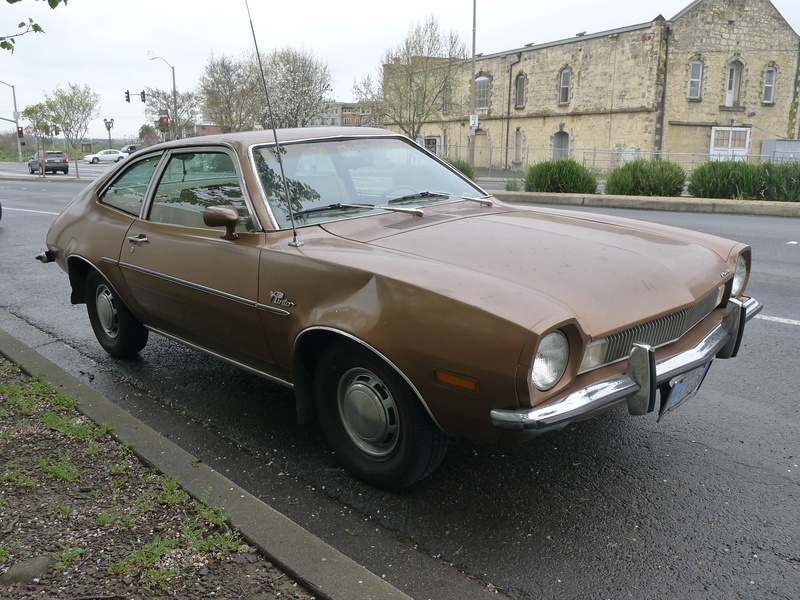 Somehow I came away from Napa, about an hour up the coast, with no photos of vineyards but one of a battered and beaten Pinto. Patty (left), my cousin Laura Eckert and her husband Doug Parker. Doug is president and c.e.o. 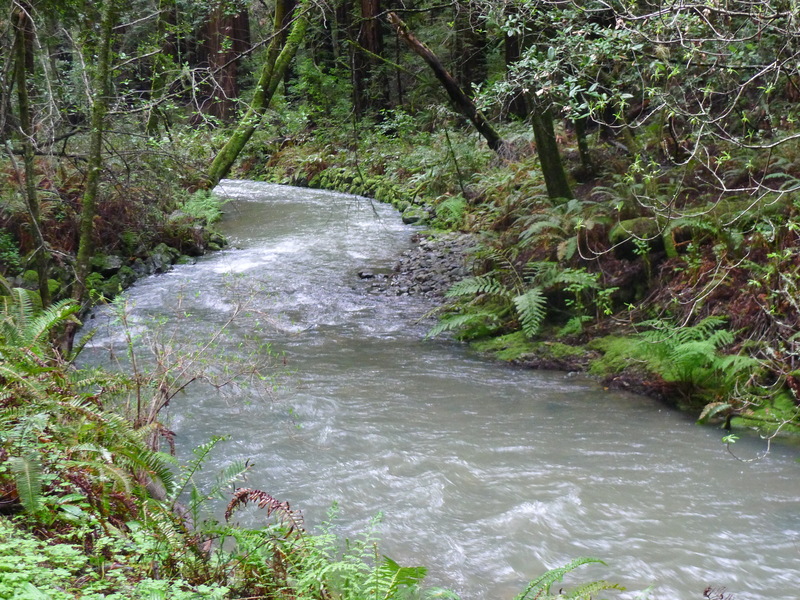 of the Land Trust of Napa County. Laura is the self-anointed, unofficial chairwoman of the Sanders for President movement in Napa County. 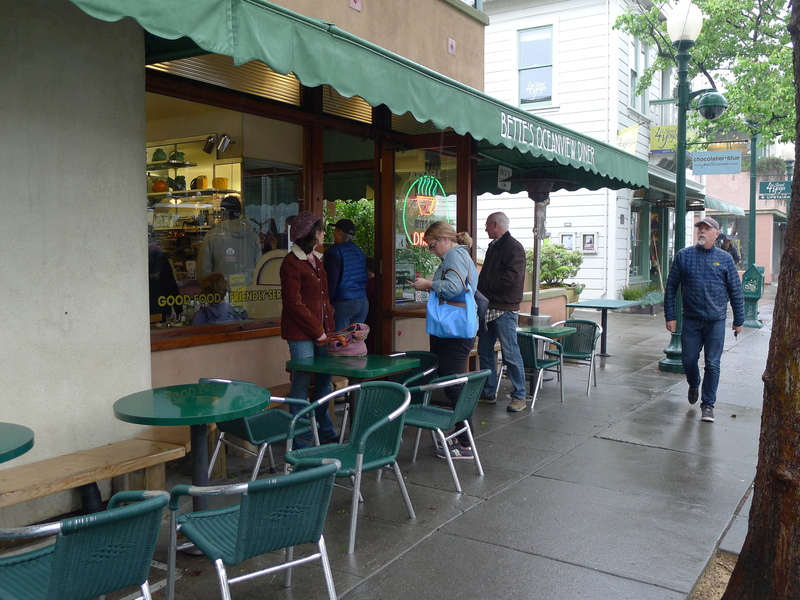 Back in Berkeley at a well-known breakfast and lunch spot, Bette’s Oceanview Diner. I told the man who greeted us I thought I recognized him from the last time we were there. That could well be, he said, seeing as how he has owned the place for 34 years. 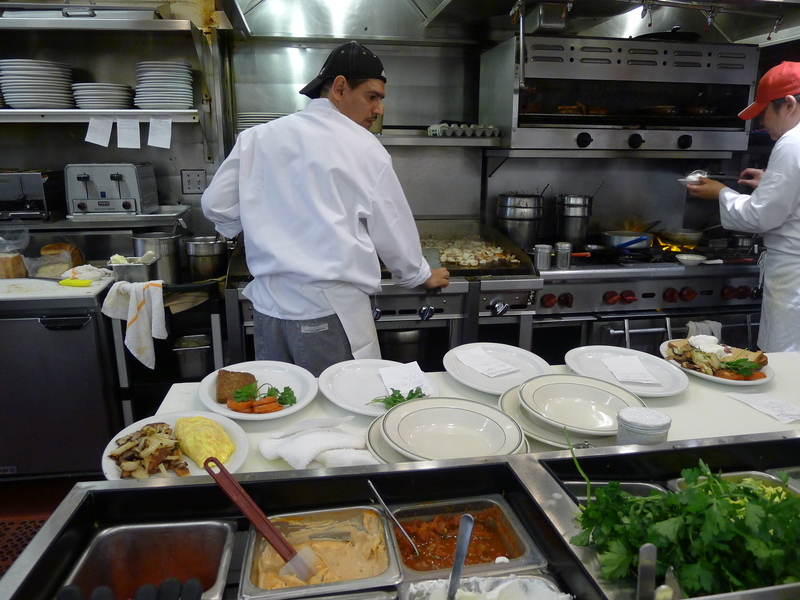 From our perch at the counter, we saw an amazing amount of mouth-watering food leave the cooking area. 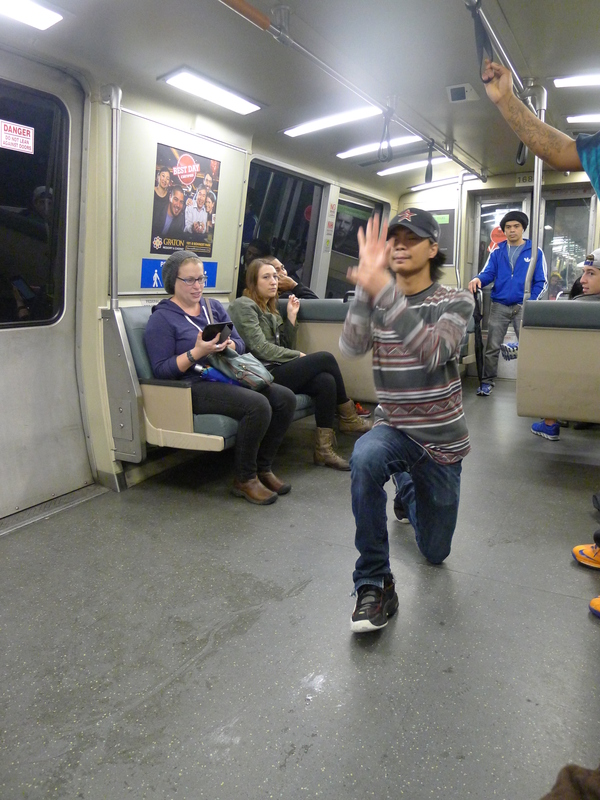 Back on the BART for another trip in to San Francisco, a group of young men working for tips entertained us with some fancy footwork and gymnastic moves. I tipped them and gave the guy on the left my black straw hat…Don’t worry, it wasn’t my only hat. 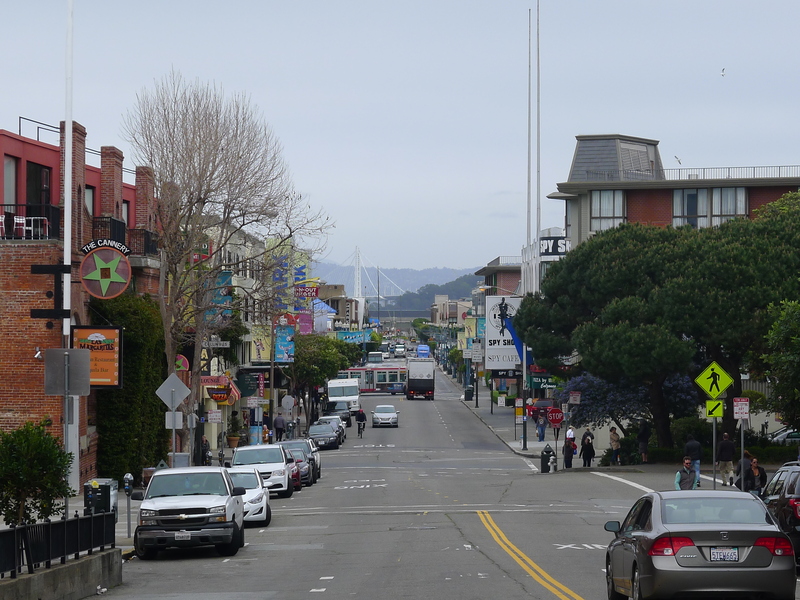 On Saturday, the day before we returned home, we went to Sausalito and Muir Woods, both of which are north of San Francisco, across the Golden Gate Bridge. 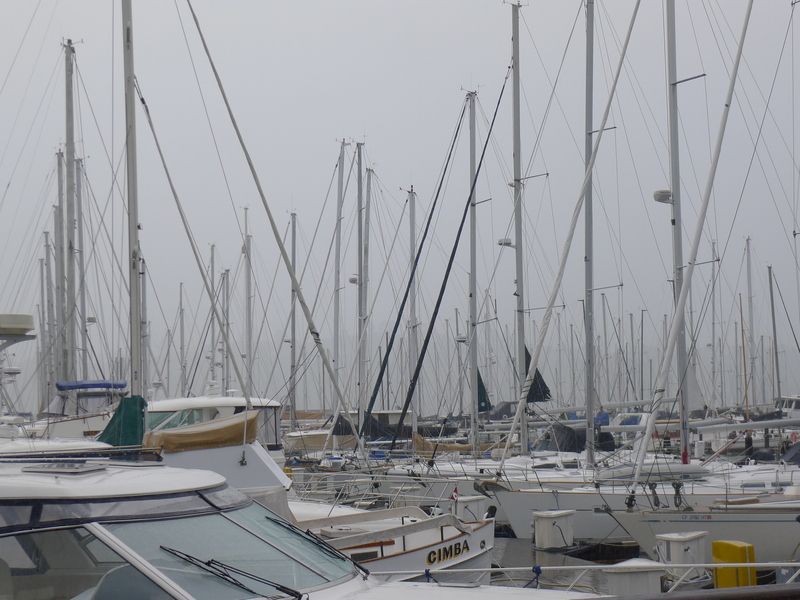 At Sausalito Harbor, the masts were as thick as the redwoods at Muir Woods. 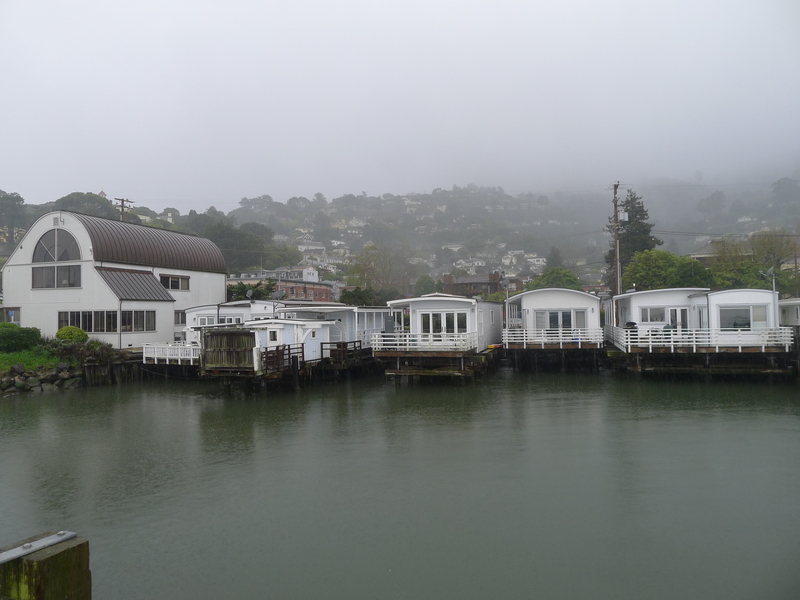 These houseboats front the street. Great view either way. 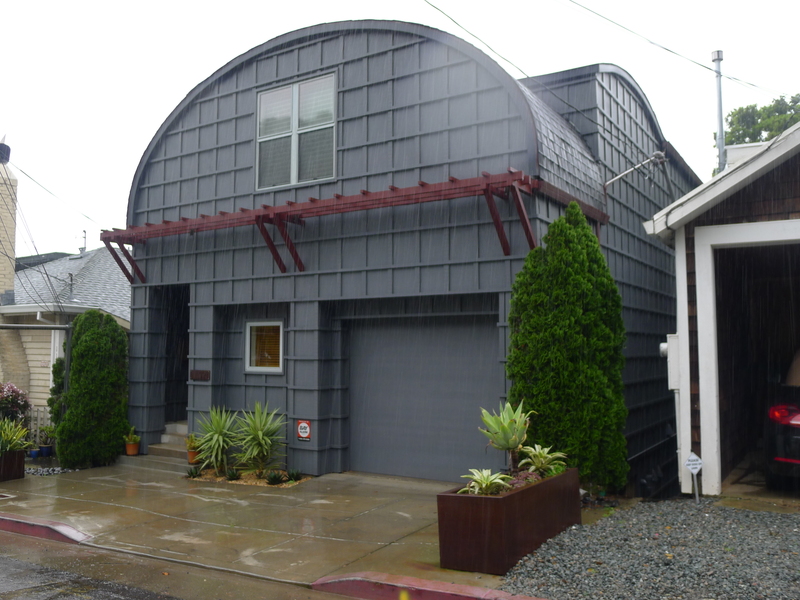 A distinctive house in the Sausalito hills. 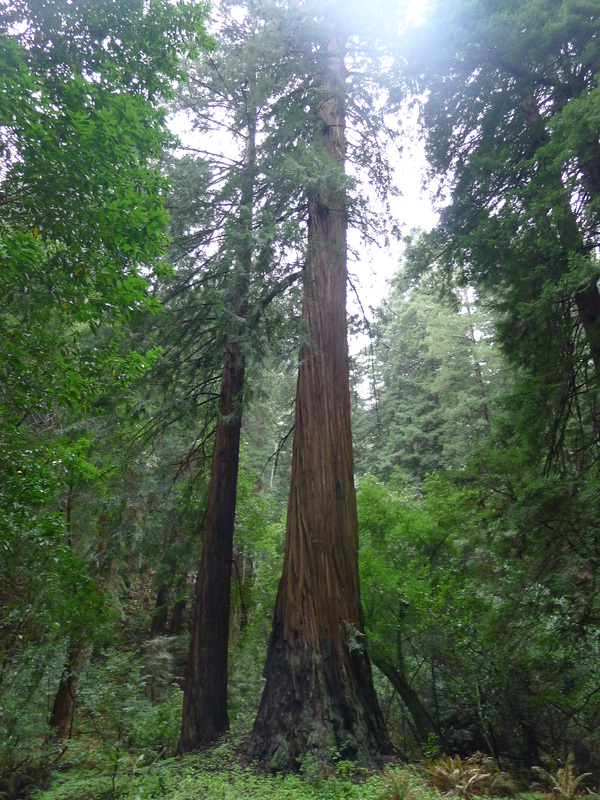 Muir Woods National Monument is a remnant of the redwood forests that blanketed many northern California coastal valleys before the 1800s. In 1908, President Theodore Roosevelt used the 1906 Antiquities Act to proclaim the area a national monument…Thank you, Teddy! I am out of town but just heard from a good friend about an awful tragedy that has befallen a notable Kansas Citian and his family. Madeline McDowell, 23-year-old daughter of architect Steve McDowell, of the BNIM firm, died a week ago today apparently of complications from a tonsilectomy the day before. From what I’m told, Madeline, a criminal justice student at Metropolitan Community College, underwent routine surgery on Wednesday, March 2, went to bed about 8 p.m. that night and never woke up. Just like that, in the full bloom of young adulthood, she was gone…I cannot imagine the pain her parents, Steve and Mary Anne McDowell, and her brother, Kilohy Stephen McDowell, must be enduring. In addition, there’s another intimately close person feeling incredible pain — Madeline’s birth mother, Laurie Stinson. What a tragedy for her, too, and imagine the whirlwind of feelings she must be experiencing. …I’ve met Steve McDowell but don’t know him well. His firm has left its imprint all around KC and elsewhere, and I’m sure the entire BNIM family — including partners Bob Berkebile, Tom Nelson and David Immenschuh — is in deep mourning. In case you don’t know, the firm was founded in 1970 as Patty Berkebile Nelson Love Architects (PBNL). In 1987, Patty, Berkebile and Nelson formed a new firm — PBNI — with Immenschuh. Among other structures, they designed One Kansas City Place, which, according to Wikipedia, is the tallest building in Missouri. In 1991, McDowell joined Berkebile, Nelson and Immenschu, and BNIM came into being. The firm has offices in Kansas City, Houston, Des Moines, LA and San Diego. …I’m sure my readers and commenters join me in sending heartfelt condolences to the McDowell and BNIM family. Our hearts are heavy today.